Maureen Bisognano, President and CEO of the Institute for Healthcare Improvement. 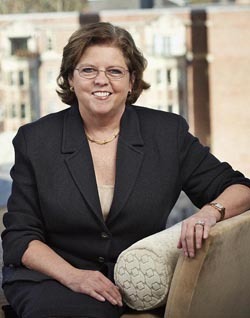 Ms. Bisognano became president and CEO of IHI in 2010, prior to which she served as IHI's executive vice president and COO for roughly 15 years. Ms. Bisognano serves as an adviser for healthcare leaders around the world, and frequently speaks at major healthcare conferences on quality improvement. She is an elected member of the Institute of Medicine, instructor of medicine at Harvard Medical School in Boston and a research associate in the Brigham and Women's Hospital Division of Social Medicine and Health Inequalities, also in Boston. Ms. Bisognano serves on the boards of the Commonwealth Fund, Cincinnati Children's Hospital Medical Center and ThedaCare Center for Healthcare Value.